A versatile piece of clothing that cares for the comfort for your baby. Mee Mee Jabla and Track pant are an essential in your baby's wardrobe as it can be used daily to keep your baby chic and comfortable at home, outside or while travelling. Made from premium quality, 100% super soft cotton fabrics, each top has snap buttons opening ensuring quick and easy dressing change for your baby with absolute ease. Available in many colours & smart designs, they're perfect for a play date, a party or any other fun baby activity. 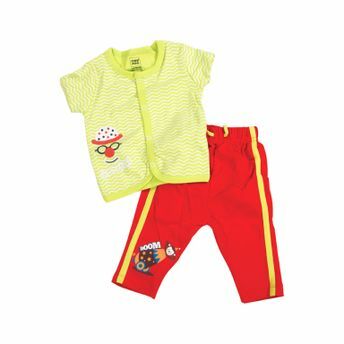 Alternatively, you can also find many more products from the Mee Mee Baby Jabla & Track Pant - Green & Red range.